Increasing procedural volumes using MRI guided & Focused Ultrasound devices for indications in the North, Europe, Latin America, China, and Asia pacific region is fueling the growth of the MRI Guided & Focused Ultrasound Devices market. The growing demand for cost effective treatment of cancer at hospitals and oncological treatment centers have increased the demand for MRI Guided & Focused Ultrasound Devices. Moreover, ease of application of MRI Guided & Focused Ultrasound Devices and the availability of MRI Guided & Focused Ultrasound Devices through traditional supply chains are leading to increasing adoption rates of MRI Guided & Focused Ultrasound Devices among end users. MRI Guided & Focused Ultrasound Devices are anticipated to gain popularity as they provide great benefits for the patient, reduced side effect profiles, and reduced costs associated with therapeutic intervention as the hospital expenditure is reduced using MRI Guided & Focused ultrasound devices. Radiation therapy has an adverse effect on bone, teeth, salivary glands, mucous membranes, skin, etc. Such effects are averted using MRI guided & focused ultrasound devices owing to their non-invasive nature and minimal use of medications of toxic chemicals in predicting, and avoiding such situations. The MRI Guided & Focused Ultrasound Devices market is largely dominated by global manufactures who are competing on the basis of adoption of MRI Guided & Focused Ultrasound devices in the market. The consolidated nature of the market and the availability of competitive procedures decreases the profitability of the business. However, growing awareness about MRI Guided & Focused Ultrasound Devices and growing demand for cost-effective diagnostic options have increased the revenue opportunities for global manufacturers. Companies, such as Chongquing HIFU Medical Tech. 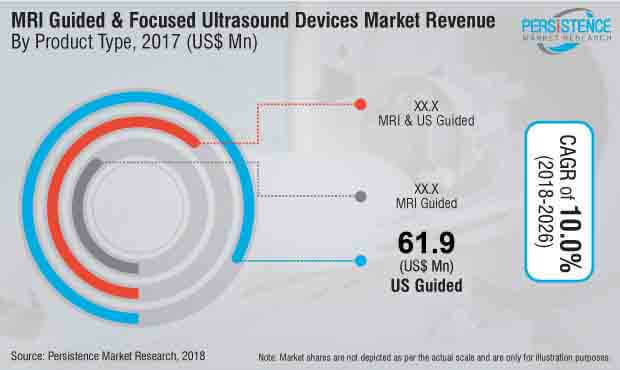 Co. Ltd, Insightech, EDAP TMS SA, & Beijing Yuande Bio-Medical Engineering, hold more than 65% revenue share in the global MRI Guided & Focused Ultrasound Devices market. These companies are continuously making efforts to launch novel product lines for MRI Guided & Focused Ultrasound Devices. Further, companies operating in MRI Guided & Focused Ultrasound Devices market are collaborating with local distributors/retailers to increase the penetration of their products in the MRI Guided & Focused Ultrasound Devices market. As per discussions held with key opinion leaders in the MRI Guided & Focused Ultrasound Devices market, China is considered to be a leader in growth for MRI Guided & Focused Ultrasound devices. There seems to be substantial growth in Europe but not as much as the growth witnessed in Asia Pacific and China market for MRI Guided & Focused Ultrasound Devices market. Manufacturers in China & APEC are estimated to grow significantly in the MRI Guided & Focused Ultrasound Devices market, but the costs levels are the main challenges for manufacturers in Europe. Adoption rates of procedures such as artery embolization, myolysis, laparoscopic myomectomy, hysteroscopic mycomectomy, and endomaterila ablation is higher and well accepted amongst clinicians and patients than MRI guided focused ultrasound device therapies for. It would take some time for the patients to become aware and adapt to MRI guided focused ultrasound therapies for Uterine fibroids. The Company’s report titled “MRI Guided & Focused Ultrasound Devices Market provides detailed information about the growth parameters of the MRI Guided & Focused Ultrasound Devices companies. It includes detailed assessment of the competitive environment in the MRI Guided & Focused Ultrasound Devices market. The market study provides comprehensive data on each stakeholder in the MRI Guided & Focused Ultrasound Devices market, including EDAP TMS SA, Chongquing HIFU Medical Tech Co Ltd, Insightech Inc, Beijing Yuande Bio-Medical Engineering, SonaCare Medical, Wuxi Haiying Medical, Alpinion Medical Systems, Profound Medical, EpiSonica, and Theraclion. The report provides readers with all-encompassing data on each MRI guided & Focused Ultrasound device manufacturer’s revenue shares, winning strategies, and latest information on key strategies in the MRI Guided & Focused Ultrasound Devices market. The market study on the MRI Guided & Focused Ultrasound Devices market was recently published by the company, which provides comprehensive information about the most important market dynamics that prove instrumental in the growth of the MRI Guided & Focused Ultrasound Devices market during 2018-2026. Companies in the MRI Guided & Focused Ultrasound Devices Market can find the most accurate quantitative and qualitative information about the growth parameters of the other MRI guided & Focused Ultrasound device manufacturers, which can help them develop data-driven business strategies in the coming future. The Company’s report on MRI Guided & Focused Ultrasound Devices market provides salient information on market players. The MRI Guided & Focused Ultrasound Devices market is segmented by geographical region, product type, indication, and end users, to analyze the segment-wise growth of the MRI Guided & Focused Ultrasound Devices market. Based on geographical region, the MRI Guided & Focused Ultrasound Devices market is segmented into six regions – North America, Latin America, Europe, Asia Pacific Excluding China (APEC), China, and the Middle East & Africa (MEA). The MRI Guided & Focused Ultrasound Devices market is segmented into product types- magnetic resonance image (MRI) Guided, Ultrasound (US) Guided, and MRI & US Guided devices. Depending on the indication, the MRI Guided & Focused Ultrasound Devices market is segregated into prostate cancer, uterine fibrosis, breast cancer, liver cancer, bone metastases, brain, and others. By End users, the MRI Guided & Focused Ultrasound Devices market is segregated into hospitals, academic & research centers, & oncological treatment centers. Which types of products account for the maximum demand for MRI Guided & Focused Ultrasound Devices market? Why is it so? Why are the sales of MRI Guided & Focused Ultrasound Devices services and products highest in North America? What are the factors customers seek in MRI Guided & Focused Ultrasound Devices? Which factors are influencing the strategies of players in the MRI Guided & Focused Ultrasound Devices market? What are the current trends adopted by various MRI Guided & Focused Ultrasound Devices companies? What are the strategies being applied by MRI guided & focused ultrasound device manufacturers in order to sustain themselves in the competitive MRI Guided & Focused Ultrasound Devices market? The process of market research followed at the company commences with extensive secondary research of the MRI Guided & Focused Ultrasound Devices market. Analysts obtain industry-validated, historic, and current data about the demand for MRI Guided & Focused Ultrasound Devices across the globe. Comprehensive secondary research is followed by extensive and in-depth primary research, where detailed information about the MRI Guided & Focused Ultrasound Devices market is obtained in terms of value (US$ Million). Based on thorough secondary and primary research of the growth parameters of the MRI Guided & Focused Ultrasound Devices market, analysts come up with the most precise forecast on how the MRI Guided & Focused Ultrasound Devices market will grow during the forecast period. Chongquing HIFU Medical Tech. Co. Ltd.